About a month or so ago I had written a tutorial for getting started with HERE using Java and the Android SDK. Even though documentation for the job already existed, I wanted to put my own spin on the process to try to make it a little easier. While Java is great, it is becoming a relic of time and slowly being replaced with Kotlin, which is considered to be the new hotness. Kotlin can compile to bytecode for the JVM and in these circumstances we can reproduce all of our Java applications with Kotlin, an entirely different, but increasingly popular language. In this tutorial, we’re going to see how to build an Android application using Kotlin that displays a HERE map. If you think the above image looks familiar, it is because it is the same example I used in my previous tutorial. We are literally just going to be displaying an interactive map. While it might sound easy, there is some configuration that must be done to make it possible. You don’t need Android Studio to work with Kotlin or to build Android applications, but it makes life a whole lot easier. 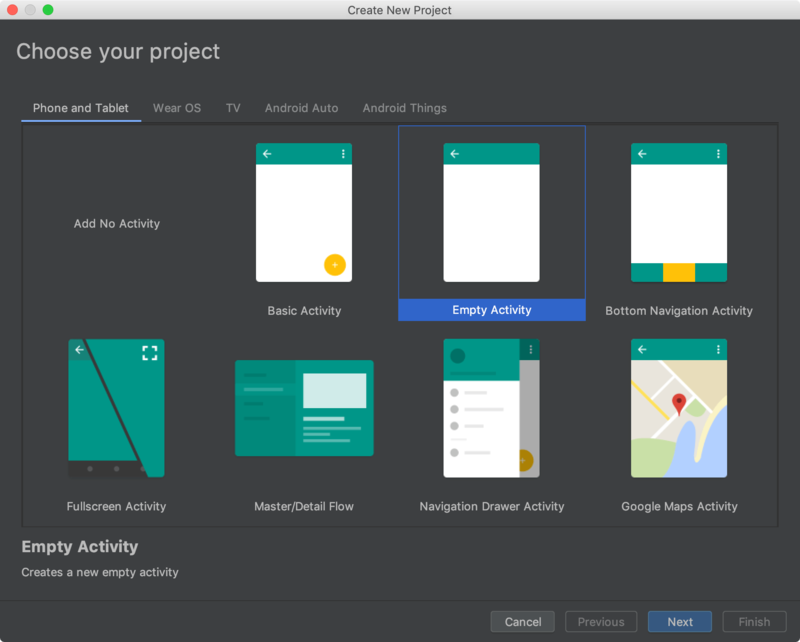 For this reason, Android Studio will be the focus for our example. I’m using Android Studio 3.3, so if you’re using a different version you might have to fill in the gaps. To start things off, choose to create a new project. Because this is a very basic example, make sure to create a project with an empty activity. If you’re feeling adventurous, pick what you feel is the most appropriate or make an attempt to use your existing project. After choosing to use an empty activity, we need to define our API versions, package naming, and language. There are two very important things to take note of at this step. You need to carefully pick your package name and make note of it because this package name will need to be used in your HERE Developer Portal. Mismatching the package will cause your API keys to not work. You’ll also need to choose Kotlin as the language rather than Java. At this point your project should be created. Android Studio will probably spend a bit of time synchronizing your dependencies. This is where we start integrating the HERE Android SDK so it can be used in development. If you don’t already have a HERE developer account, make sure you create one here. Don’t worry, developer accounts are free and you don’t even need to provide a credit card. 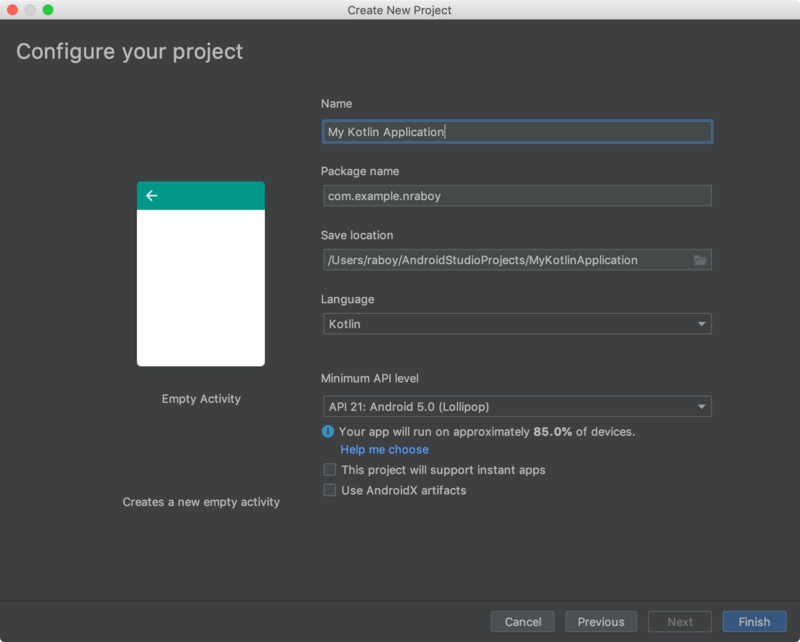 You’ll want to create a new project in your developer account and generate a new Android SDK Starter. Remember to provide your Android package when generating your API tokens. After generating a new Android application in the portal, you’ll need to download the SDK. After downloading the SDK, locate the HERE-sdk.aar file and place it in your project’s app/libs directory. After adding the appropriate permissions, we need to link our application to the credentials found in our HERE Developer Portal. This is where the app id and app code become important. Make sure that you use the tokens found in your account, otherwise the map will not display and you won’t have all the great features that HERE has to offer. Finally, you’ll notice that we have enabled hardware acceleration through the android:hardwareAccelerated="true" line. We can start using the HERE Android SDK for development as of now. To be honest, most of the above configuration and setup was the same as the Java version found in my previous tutorial. Kotlin is great, but I’m far more fluent in Java and other programming languages. While everything you see next will work, go easy on me because I’m not a Kotlin professional and power user. I’m learning like everyone else, so if you find something that can be optimized, let me know. Take note of the mapfragment fragment id because it will be used in our Kotlin code. With our super simple UI out of the way, let’s get into the bulk of our code. In the above code we are defining two private variables. The mapFragment variable will be tied to our UI component while the map variable will allow us to interact with the map component residing in the UI component. After the activity is created, we get our fragment and initialize it. If there are no errors, we can center the map and set the zoom level. Of course we could do other things such as find places, but this is a simple example. Run the application and see all of its simplistic glory! 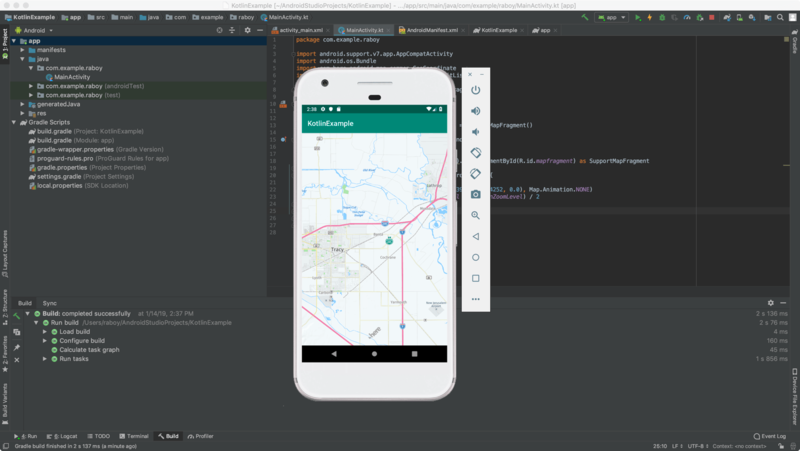 You just saw how to use Kotlin and the HERE Android SDK to create an Android application with maps and location services support. For this particular example, most of the tutorial was preparation and it really wasn’t too different than the Java version that I had written about previously. However, the core application logic used Kotlin instead of Java.